A felony conviction is no small thing. There is, of course, the conviction itself and the penalties (like prison time) that go along with it. There is also what could be termed a residual effect, ramifications that follow a felon around once he or she has completed serving his or her sentence. In many states, for example, ex-felons face restrictions on their ability to vote, serve on juries, or own firearms. There may also be negative effects that come with simply being charged with a felony, as anyone who has been put in that position can probably tell you. 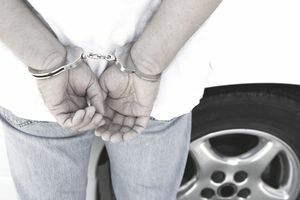 If you are facing a felony charge for the first time, you may be wondering what unforeseen problems might be coming your way, like how your charges might affect your auto insurance rate. So, read on as we try to answer the question: Will my car insurance go up if I am charged with a felony? The name of the game when it comes to insurance rates is risk and auto insurance is certainly no exception. Car insurance companies are in the business to make a profit. So, as you might expect, they have become pretty good about determining risk. Very, very good. And if something about you or your behavior can be measured to gauge better the chances that they will have to pay out a claim, you can bet they are taking it into account. One item that is sure to show up on your MVR is a felony DUI conviction, and a DUI conviction will most certainly make your insurance rates go up, probably by a lot. But the resulting rate increase isn't really because there's a felony on your record, it's because the conviction has to do with your driving. The reality is this: if you are convicted of a felony (or misdemeanor, for that matter) DUI, your insurance company is going to find out, and they are going to raise your rates. There is a big difference between those two, isn't there? And that could mean a big difference when it comes to your auto insurance bill, but it may depend on your jurisdiction. In many cases, a person's arrest record is automatically expunged if there is no conviction. If not, in most jurisdictions an individual can apply to have his or her arrest record expunged. Again, that is, if there has been no conviction. Additionally, many jurisdictions will, in certain cases, expunge a person's criminal record even if he or she has been convicted once the sentence has been completed. Most importantly, an insurer may not bother looking at a criminal record at all. They will most likely to be satisfied with an examination of a customer's MVR. So, will your insurance rates go up if you are charged with a felony? Chances are that they won't, especially if the charge is unrelated to your driving. And that's mainly because your insurer will probably never know about it unless it shows up on your MVR. A driving-related conviction may be another case entirely, though, so the best course of action is to stay out of trouble when driving. And don't drink and drive. That way you won't have to worry about rising insurance rates to start with. Will Your Car Insurance Be Canceled After a DUI Conviction? Why Are You Being Required to File a SR22 on Your Car Insurance? Can You Be Forced to Exclude a Driver? No Car, No License, and Still Have SR 22 Insurance? Why Is Your Car Insurance Ditching You? Am I a High Risk Driver? Do You Need SR22 Car Insurance?